Top 10 off lane heroes. 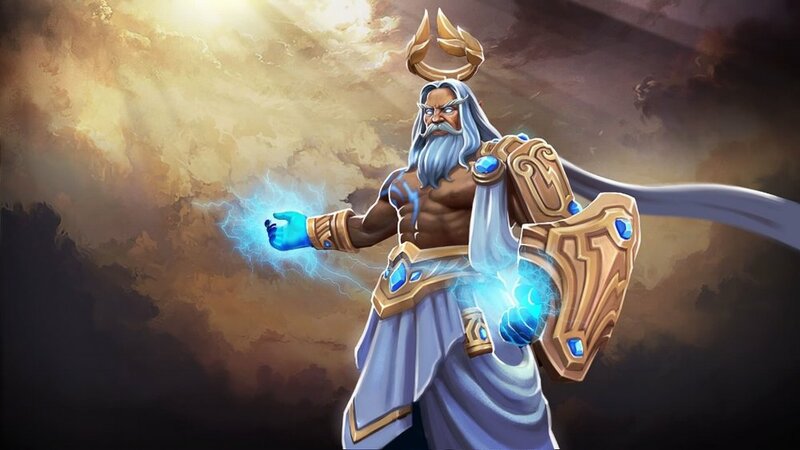 We talked extensively about Zeus in the previous mid lane article. His popularity rose even more, going from a 10.7% to a 12.9% pick rate at Divine. I expected several nerfs to balance the hero, instead Valve only increased the mana cost of Lightning Bolt from 75/95/115/135 to 90/105/120/135 in 7.17. The change is negligible as it barely affects his first levels, and can be compensated with a Clarity potion (50 gold). There are many possible approaches to adjust Zeus’ performance: I believe that extending the cooldown of Nimbus is indispensable. The skill requires the Aghanim’s Scepter to be unlocked - so there is a gold cost - but it is insanely powerful. Every 35 seconds, you can cast an AoE spell anywhere on the map that procs up to 16 Lightning Bolts in the area. They damage the opponents, grant True Sight, and mini-stun the target (great to disable channeled abilities and teleports). It doesn’t require vision, and can strike also invisible units inside the Fog of War. The total damage for 16 Lightning Bolts is 5,600 - before any reduction. Map awareness or communication are sufficient to boost the gank chances of your teammates. Using Thundergod's Wrath slows the reaction time of the enemy team: many will question the reason behind your ultimate, those farming in a risky position will try to retreat, and overall most players will think about their own safety first - some will panic :D.
Your ultimate inflicted some damage already , and Nimbus is an excellent addition for the stun and extra damage. Do not save it for the last moment, but use it as soon as feasible because your ganker needs to deal with the enemy hero quickly, and escape from the area before getting caught by the opponents. Unfortunately, this tactic is rarely used at lower ranks, where Zeus players often save their global spells to “steal” the kill. It is worth to mention that with the level 20 talent +0.5s Lightning Bolt Ministun and the Refresher Orb, you can basically stun lock an enemy in the area for the whole duration. In June, pros have drafted Zeus in 12 games (9.7%) so far, and scored a 50% win rate. But, balancing heroes only according to their performance in competitive gaming can cause huge problems in pubs, and Zeus is a perfect example. Probably, IceFrog will only implement a few changes per patch until the pick and win rate of the hero becomes reasonable both in pub and pro games. The removal of the Poor Man’s Shield in 7.07 affected many melee heroes as they became more vulnerable to harassment during the lane phase. It is really harder to survive against ranged heroes with a good right-click damage as you can’t block a portion of it anymore. There is no realistic replacement to the PMS, but Valve had to remove this overused item because it influenced the game too much (similarly to the Iron Talon, removed in the same patch). 7.12: base armor from -2 to -1. 7.13b: strength gain from 2.1 to 2.4. 7.15: base strength from 19 to 20. Nothing substantial - and we are still talking about a squishy hero with 560 HP and 3.4 armor at level 1 - but any help is welcomed. On the other hand, he possesses Flame Guard: it isn’t only an offensive spell, but a solid tool to deal versus casters in the early-mid game because it absorbs up to 500 magical damage while active. 7.14 improved the magic damage barrier from 50/200/350/500 to 80/220/360/500. The above mentioned buffs to his survivability. The recent rise in pick rate of Phantom Lancer and Warlock. The actual meta: players tend to leave the lane earlier than in the past, group up, and fight or push together. Sleight of Fist attack damage bonus against heroes has been buffed in 7.08 and 7.09, going from 20/40/60/80 to 30/60/90/120. Phantom Lancer and Warlock are very popular heroes in the current meta (both in a pub and competitive environment). In particular, the latter became the third most picked hero in the game at 5k+ MMR. Phantom Lancer is able to inflict a huge amount of damage - even without considering his illusions as the hero possesses great stats and a 2.8 agility gain. Survivability remains an issue, so he must rely on the protection of the team and the confusion provoked by his army of clones. Warlock is a strong team player, and all his abilities can have a massive impact in teamfight. With Fatal Bonds, Chaotic Offering, and Upheaval he brings a lot on the table (AoE damage, stun, and slow) and is fight-ready starting from level 6-7. Learn more: How to counter Phantom Lancer. The meta promotes such heroes because the lane phase usually ends early (unless you are in the 1-3k MMR range) and most players know they must gank and push together to get towers, snowball, and claim the victory. Flame Guard is valuable in the first stages of the match, but later on the real burst damage is caused by Sleight of Fist. I am aware that there are many magic-based builds, but I consider the physical-based one the superior choice in most cases. Sleight of Fist received a substantial buff as now it deals 40 more damage on all heroes once maxed out. The skill is excellent in teamfight, where it can hit multiple units at a time, especially if you have items such as the Battle Fury and the Daedalus to boost the AoE damage. I love also the least used alternative, the Maelstrom, as hitting several heroes will usually proc it numerous times (do not forget that Chain Lightning has a 0.2s cooldown). PL and Warlock may be a liability for their team when facing Ember Spirit. The illusions and the golems are extra targets for Sleight of Fist, so your teammates around them will receive AoE damage due to the Battle Fury. Phantom Lancer is hard countered because he will lose his army, thus the enemy team will easily spot him on the battlefield. Finally, Ember Spirit works great also paired with Warlock as he can exploit Fatal Bonds to inflict even more damage to all opponents simultaneously. Team Liquid’s Miracle- on Ember Spirit with Maelstrom. Queen of Pain and Outworld Devourer dropped from the top 10, and have been replaced by Ember Spirit and Templar Assassin. In short, this is a small buff to the level 20 talent Cataclysm. Now (with a minimum distance of 160 and maximum of 200) it is slightly more efficient, and at least one Sun Strike should hit a hero more often than not. The top 10 most popular Dota 2 heroes in the mid lane during 7.16. We will have a look at some of the best picks in the meta, and learn how to play or counter them. The top 10 most popular Dota 2 heroes in the mid lane during 7.19c. We will learn the best picks in the meta, how to play or counter them, and the patch changes.